An original Christmas Baubles crochet pattern by June Gilbank. This is much more than one crochet pattern. 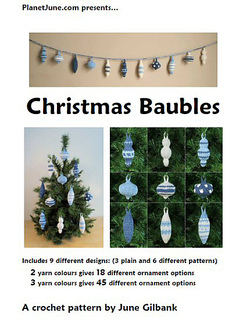 With this pattern you’ll receive 9 different bauble designs (3 plain and 6 different patterns). 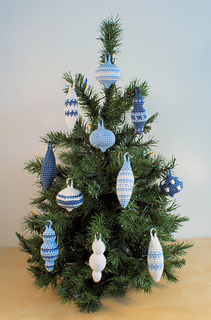 With 2 different yarn colours, you can crochet 18 different ornaments. 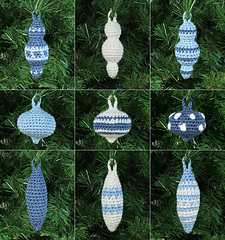 With 3 different yarn colours, you can crochet 45 different ornaments! Size: Baubles are the same size as bought Christmas decorations (but far more personal and customizable!) at between 2.5 and 4” tall (not including hanging loops) and between 1.75 and 2.5” wide.